Save, Save and Save with Samsung’s Smart Inverter. When reducing energy costs with an air conditioner, and inverter is a must. Samsung’s S-Inverter technology lowers energy consumption by up to 50% compared to a conventional air conditioner. Its powerful and delicate features allow you to reach the desired temperature so there’s less fluctuation and less motor run-time, which translates to a quieter system and less wasted energy. Samsung’s air conditioner works at maximum capacity on start-up. As soon as the desired temperature is reached, it adjusts to cope with any changes. This means less temperature fluctuations and assures you greater comfort, which can be achieved in minutes. After reaching the set temperature, the Air Conditioner changes its operation mode to ‘economic’. By avoiding inefficient and frequent switching on and off of the compressor, the Vivace saves up to 50% in energy consumption, compared to a non inverter air conditioner. The Air Conditioner is extremely efficient in saving energy and money. 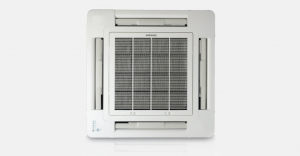 Enjoy the silent operation of your air conditioner. The compressor works at a low speed to maintain the temperature resulting in a quieter motor and minimal fan noise assuring greater comfort and peace of mind. Samsung’s Ducted series air conditioners are equipped with Samsung’s Smart Inverter technology which is a combination of cutting-edge technology with exceptional performance characteristics. Fast and powerful cooling and heating are achieved with minimum power consumption. As a result, your electric bills are greatly reduced compared to other conventional systems while the extraordinary comfort that you’ve come to expect from Samsung is maintained. Smart Inverter air conditioners from Samsung are the perfect choice for those who appreciate high performance and energy conservation. Samsung has applied a 3-dimensional blade, which has a worldwide patent, to provide equal speed to the cool air and boostup the airflow to spread further and wider to cover all the corners of the space being cooled. With this newly-designed blade,every bit of space will be filled with cool, refreshing air. The 4-Way Casette has gotten even slimmer. Now as thin as 8 5/8 inches, it’s still the industry leader in compactness and is even easier to install in tight spaces (36K and 48K BTU units are 11 3/4 inches thick). The newly-designed panel will control the air direction to avoid having contact with the ceiling. This will prevent the ceiling from becoming soiled and will ensure cleanliness for a long time after installation. Fresh air can be introduced into the room via the fresh air connection. This drain pump lifts condensate up to 29 1/2 inches, allowing for flexible and simple installation. he aerodynamically designed “Turbo Fan” minimizes noise from the turbulence of the blade movement. Thus, even the highest fan speed produces almost no noise. Is one area of the room freezing, while another area is hot? The new “Turbo Fan” has wide blades that provide extreme cooling power from four separate outles so the entire room gets cooler, faster.